Darkness, fog and cold of late autumn in the streets of North Mitrovica. The smell of diesel and the noise of generators. Lights in small shops and some institutions. On the streets you can hear the clamor of youth out for the weekend. An urban group rushing to get to the concert of popular group Beogradski Sindikat. The rappers arrived from Belgrade to the north of Kosovo via an alternative route. When the electricity is cut out they shout, “Save Serbia and kill yourself, Boris, Boris”, a slogan from the time of Milošević. A strange and difficult situation in the North. In this now inflamed appendix of Serbia, there are as many things as in the slava pot and there is nothing like in the darkness when the power goes out. Almost exactly six months since ROSU units attempted to take over the administrative crossings, the uneven road to Belgrade through Jarinje is no longer in use. The situation is the same on the road to Brnjak, another administrative crossing to Montenegro. At the crossings are Kosovo police and EULEX customs officers encircles by their own obstacles, placed right next to the Serbian pile of gravel. Serbs have been blocking the roads to EULEX and KFOR units for months, although KFOR vehicles are permitted to pass. KFOR soldiers have removed the barricades several times but the Serbs immediately installed new ones. Videos are available on the Internet of almost comical scenes where international soldiers use shovels to remove the barricades of earth and move the Serbs, while the latter simultaneously use a dredger to install new ones right next to previous ones. “They can never close as many roads as we can built. We’ll make tunnels if we have to. We’re a tough people. We’ve never grown accustomed to anything better. God will grant that we see these ones gone, too.” The terse sentences are uttered with an apparent lack of interest by a local truck driver unloading goods from his dusty truck at the entrance to North Mitrovica, who declines to be named in this text. Gone now are the KFOR educational message boards of peace: “Tolerance”, “We are here to ensure your safety”, etc. Instead, new billboards remind that this is Serbian territory, that KFOR is increasingly an occupying force and recalls the suffering of the Serbs. 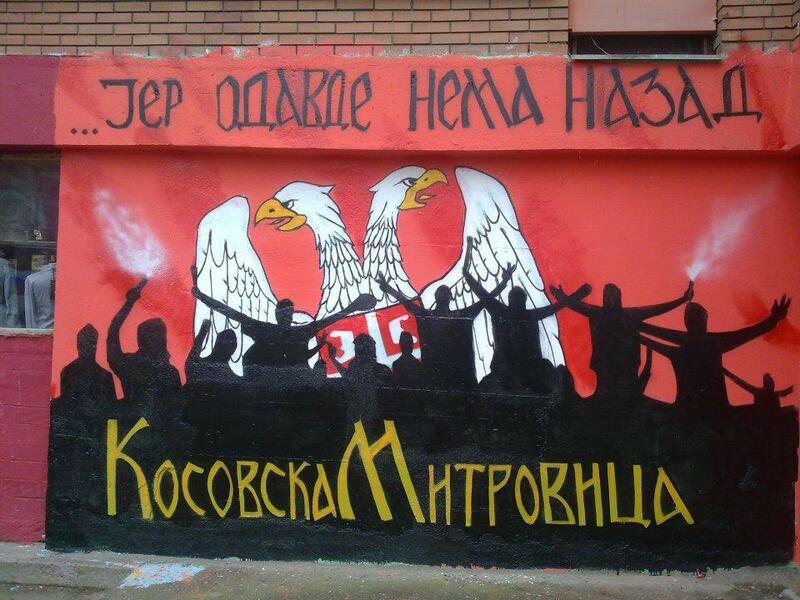 Graffiti is written in large letters on many buildings: “There’s no turning back”, “Tadić is a traitor”, “Eulex go home”, “Russia, help us” and “Savo Mojsić, Serbian hero”. Savo Mojsić was a Serbian youth who was recently killed in the mixed quarter of Brđani in North Mitrovica, when someone opened automatic gun fire on a group of Serbian youths, injuring two other Serbs. Despite strong condemnations by leading Albanian and international officials in Kosovo and confirmations that EULEX and the KPS are conducting an investigation, no concrete progress in the investigation has yet been made public. In a tense atmosphere, North Mitrovica has been frequently visited by European officials since November. Their protocols vary from hours of talks with the Serbs in the North to political exotica – having their picture taken in a Balkan crisis point. “In the north of Kosovo we have people who are acting like criminals, rather than like politicians. They are blocking roads and preventing the free movement of KFOR and EULEX, as well as of the citizens. These are backdoor ploys, which have nothing to do with politics,” European Parliament member Doris Pack, known as a long-time advocate of Kosovo’s independence, told the Pristina media. Swedish minister of foreign affairs Carl Bildt, who met with several NGOs in North Mitrovica, was more moderate. “There are a lot of people in the North who do not like the independence of Kosovo. I do not know if you can convince them to change their minds. But many Serbs live south of the Ibar River. I am not totally convinced that they are enthusiastic about Kosovo’s independence but they accept it and live with it. This was a process; a few years ago this was not the case. And this is the sort of long-term patience that is needed to overcome the outstanding issues in the North, as well as some other issues. But trust is crucial,” said Bildt in Pristina, only a few hours before the shooting of the three young men in Brđani. At about the same time, the Pristina paper Koha Ditore published that the Kosovo government is preparing a new “comprehensive” plan for North Kosovo, which foresees an end to the financing of “parallel” Serbian structures. The Pristina daily also wrote about the political instructions of the European Commission for Kosovo institution to propose a new vision for the north of Kosovo in their intent “to govern the North, as a part of their territory”. Under this plan, the Kosovo government is supposed to establish direct contact with the Serbs in the North, to “gradually approach the local leaders in the North” and “to promote a new political class”. The courts will be fully operational, with the opening of a regional police station in the north. This document states that the Kosovo government should “create an atmosphere for holding elections” with the support of the OSCE “after Serbia has ceased to finance parallel structures”. This plan does not differ much from the Ahtisaari plan, and previous strategy for the North. Mayors of Serbian municipalities in the north of Kosovo have said that the latest agreement from Brussels between chief Serbian negotiator Borko Stefanović and Edita Tahiri from Pristina on “integrated management of customs” is nothing more than a copy of the solution from the Ahtisaari plan, which has been repeatedly rejected by Serbia. The split: Kosovo Serbs – Belgrade? Publicly there is already, following the model of the 1990’s and the Bosnian Serbs, spin about a new conflict between the Serbs from the North and the Belgrade government. The mayors of municipalities in the north, the district chief and all the MPs from the north of Kosovo in the Serbian Parliament, regardless of whether their party is in the government or the opposition, are united in rejecting an agreement on customs. At the resumption of talks in Brussels this week, after a two-month interruption, Borko Stefanović went to Brussels burdened by the lack of a unanimous policy on Kosovo within the government itself, as well as the lack of the majority support of the parliament, despite official denials. The latest example is the failure of the ruling coalition to adopt yet another declaration on Kosovo in parliament, the draft of which did not even appear in parliamentary procedure, when it became clear that the government itself lacked the necessary majority. Talks in Brussels were discontinued after Serb clashes with KFOR in September. Vuk Drašković soon thereafter publicly released confidential information from the parliamentary committee for security that the incident had in fact been provoked by “criminals from the north” and immediately after that there was a story about a controversial businessman from the North, Zvonko Veslinović, “the new Arkan” according to the media. For days the subject of alleged Serbian criminals from the north and their leader Zvonko Veslinović was the top news of the Belgrade media and politicians. This was an introduction for the establishment of the social movement Preokret (Turning Point), whose leaders are two Serbian politicians who until yesterday were incompatible not only by age but by their political ideologies: the monarchist and “epic” leader Drašković and liberal Čedomir Jovanović. They are now united by the idea of Serbian within the European Union, and an urgent chance of Serbia’s policy towards Kosovo. International pressure on the Belgrade government to abandon the North corresponds to support for Pristina in establishing governance of the compact Serbian territory.